Ms. Binns was born in Bury, Greater Manchester, England. She enjoyed drama at school and was lucky to be picked for Children's Ward in 1998. She is best known for her two major roles, one as Ollie in Emmerdale and, of course, as Molly Compton Dobbs in Coronation Street. 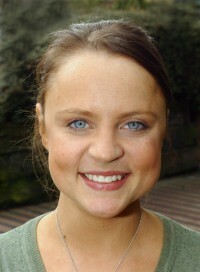 She started on Corrie in 2005 as Baker Diggory Compton's daughter. Her backstory revealed that she went to school with Fiz who bullied her. As a result, Molly decided to win Fiz's boyfriend, Kirk, away from her. She wasn't successful in the end. She did work with Kirk at the Kennels for awhile and then got a job in the corner shop. She eventually got together with Tyrone Dobbs after he and Maria Sutherland broke up (their second time around) and they married in early 2009, a year after the death of Vera Duckworth. They bought Number 9 and settled in, with Jack as lodger. Molly discovered that Tyrone's best friend and business partner, Kevin Webster, had a crush on her and though shocked at first, was intrigued. She and Kevin trained together for a fun run and ended up having a passionate affair. Just as Kevin was going to leave Sally for Molly, he discovered that Sally had breast cancer and realized where his priorities lie. He didnt' leave though Molly tried to persuade him. She left Tyrone anyway but when she discovered she was pregnant, she returned home since Kevin didn't want to know. On our screens at the time of Vicky's visit, we don't know yet who the father of Molly's baby is, Tyrone or Kevin. Ms. Binns's other TV credits include: Children's Ward; Emmerdale; Von Trapped; Nature Boy.